Throughout the month of October, the Disability Cultural Center (DCC) and a host of campus partners and student organizations will host Disability Awareness and Appreciation Month. The month’s events will focus on disability and its many intersections. 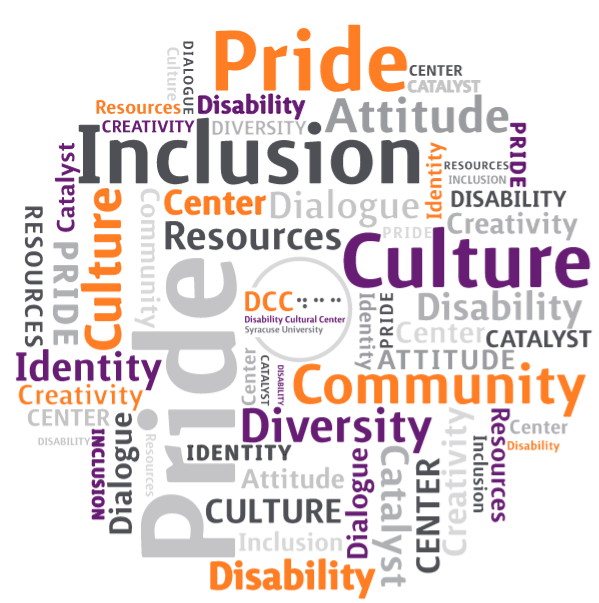 In addition to the list of events, throughout October the Syracuse University Libraries will host a multi-formatted exhibition on disability cultures, pride and identities, co-hosted with the DCC, the Disability Student Union (DSU) and the Disability Studies Program. The exhibition run from the first week of October to Oct. 31 in E.S. Bird Library. E.M.P.A. candidate and U.S. Air Force veteran Adam LeGrand will outline the perceptions of service animals in the United States, laws concerning public access and where policy is headed. Food will be provided at the start of the event. R.S.V.P. to the Executive Education Student email address: ExecEdStudents@maxwell.syr.edu. Those with requests regarding accessibility or accommodations may contact the Equal Opportunity, Inclusion and Resolution Services (EOIRS) office at ada@syr.edu or 315.443.4018. The event is sponsored by Maxwell Peer to Peer. Celebrating disability rights activists Lydia X.Z. Brown and Shain M. Neumeier’s impactful, scholarly-activist work, the event will highlight the intersections of disability, race, gender, sexual orientation, and global and local identities, among other timely subjects. Brown and Neumeier will give a presentation from 7 to 8 p.m. in Watson Theater, followed by a reception and book signing of “All the Weight of Our Dreams: On Living Racialized Autism,” of which Brown is the lead editor, from 8 to 9 p.m. in the Light Work lobby. Inclusive refreshments will be served. American Sign Language (ASL) interpretation will be provided during the presentation and reception/book signing, and Communication Access Real-time Translation (CART) will be provided during the presentation. Parking is available in the Marion lot; those who need accessible parking may use the Q5 lot. Questions pertaining to parking may be addressed to Dee Bailey at mdebailey@syr.edu. A campus parking map is available online at goo.gl/7wA7ra. For other accommodation requests or questions, contact sudcc@syr.edu. This event is sponsored by the DCC, with co-sponsorship by the Center on Human Policy; Interdisciplinary Programs and Outreach, the Burton Blatt Institute; and the Department of Communication and Rhetorical Studies, with support from a host of academic and administrative departments and student organizations. The event is held in celebration of Disability Awareness and Appreciation Month, LGBTQ History Month and Latinx and Hispanic Heritage Month, and held in concert with Mental Health Awareness Week. A brown bag poetry reading with DCC Director Diane R. Wiener and Office of Disability Services’ Coordinator Kristofor P. Minta. ASL interpretation and CART will be provided. Wiener will be reading from her debut poetry collection, “The Golem Verses” (Nine Mile Press, 2018). The event is hosted by the Syracuse University Libraries. OrangeAbility, Syracuse University’s accessible sports expo, returns. Join the DSU, the Beyond Compliance Coordinating Committee, the DCC, MoveAlong Inc. and Recreation Services in engaging with local teams on the court, as well as organizations in the expo area. The event is open to all, adults and children. ASL interpretation will be provided. DCC Director Diane R. Wiener will present at Crouse Hospital in acknowledgment of Disability Employment Awareness Month and Coming Out Month. Wiener will share two presentations and read poems from “The Golem Verses.” ASL interpretation will be provided. For details and accommodations inquiries, e-mail TwiggyEure@crouse.org. Webber is the creator of the graphic memoir Dumb: Living Without a Voice. The memoir addresses Webber’s narrative on losing her voice due to a medical condition and the social and cultural discourses surrounding the experience. The event will be moderated by Kate Deibel, Syracuse University Libraries inclusion and accessibility librarian. ASL interpretation and CART will be provided. The event is sponsored by the Syracuse University Libraries, the College of Visual and Performing Arts and the DCC. The conference will provide opportunities for colleges and universities, researchers, program staff, parents and self-advocates to learn about the current state of research and practice in the field, and to network with each other. For more information, visit sotaconference.com/. An online conference for students with disabilities by students with disabilities, Disabled and Proud focuses on access, inclusion and changing campus climates for people with disabilities/disabled people. The conference is open and free to the University community. DSU President Priya Penner, DCC Coordinator Kate Pollack and DCC Director Diane R. Wiener will all present at the conference. The Disability Cultural Center has reserved online access for all campus constituents; use the e-mail dwiener@syr.edu and password CRIP@66. For instructions on accessing the conference, visit facebook.com/sudcc/. Poets Doug Anderson and Preston Hood will read their poetry. This event will include a focus on the experience of disabled veterans. ASL interpretation and CART will be provided. Co-hosted by the DCC; Interdisciplinary Programs and Outreach, The Burton Blatt Institute; and the Student Veterans Organization. The film “Intelligent Lives” will be screened as part of Syracuse International Film Festival’s Imaging Disability showcase. The film is captioned; ASL interpretation and CART will be provided for the introduction and discussion. Syracuse University is participating in Disability Mentoring Day in many ways, serving as a host site for numerous mentees. Disability Mentoring Day is a nationwide effort to promote career development for students with disabilities through hands-on career exploration. The DCC will host its annual Open House, which will conclude with a gathering to watch and discuss “Hannah Gadsby: Nanette,” which is captioned. A reception with inclusive food, with popcorn, will be part of the event. The gathering and discussion are co-sponsored by the DCC and the DSU. ASL interpretation will be provided. Check out “Hannah Gadsby: Nanette” trailer at youtube.com/watch?v=5aE29fiatQ0. Carrie Brown will share information about the Kekeli Foundation and the work it does. For more information, contact Rachel Zubal-Ruggieri at razubal@syr.edu. For more information about Disability Awareness and Appreciation Month, email the DCC at sudcc@syr.edu.